A group of Muslims who were under ISIS rule near the Syrian-Turkish border explained why they decided to convert to Christianity instead. Farhad Jasim, 23, who is one of many residents of Kobani, a strategic Syrian city, attending the first Christian place of worship in the area for decades, said he couldn’t fathom the religious undertones to ISIS’s brutal acts. Jasim, a mechanic, converted to Christianity late last year. He was jailed by ISIS for six months in 2016, during which he was tortured and forced to read the Quran, after the group found out he didn’t know the basics of Islam. He became “skeptical” in his belief of his original religion after witnessing ISIS’s “brutality” with his “own eyes,” he said. Those who abandon Islam are often ostracized by their families and communities, making religious conversion rare in Syria. About 4.6 percent of the Syrian population is believed to be Christian. A man who requested to be named as Omar, a 38-year-old administrator at the Church of the Brethren, a Protestant church, said it was “strictly forbidden” to change religions, even under the Syrian regime before the revolution. Omar asked that his real name not be used for fears of his safety, and the church’s priests declined to partake in an interview. After Jasim heard about the Church of the Brethren – which opened in September and traces its origins to 18th century Germany – he said it “didn’t take long to discover that Christianity was the religion” he was searching for. But, Jasim’s relationship with his parents and extended family became nonexistent after he converted, he said. 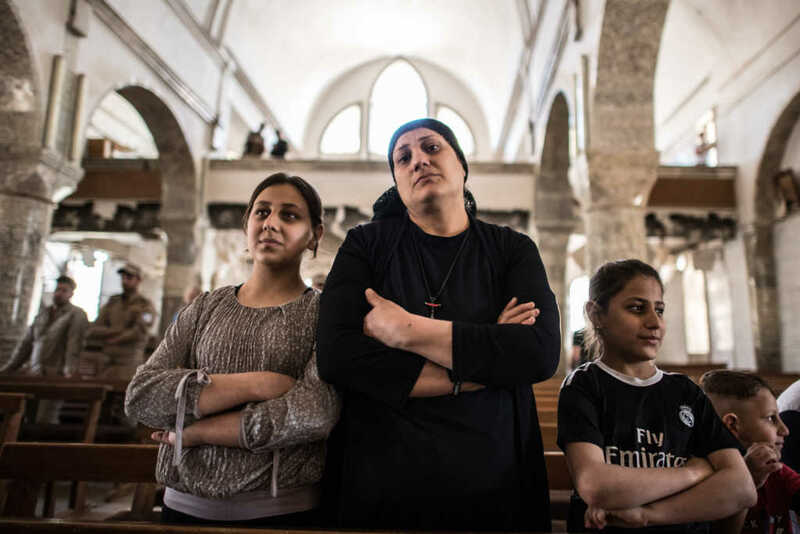 Otherwise, people in Kobani have been open-minded about Christianity as residents continue to grapple with the emotional scars they endured at the hands of ISIS, Omar said. Meanwhile, Islamic leaders all over the world accuse ISIS of warping the message of the religion to serve their violent ideologies. The terrorists have “misinterpreted Islam into a religion of harshness, brutality, torture and murder,” more than 100 Muslim scholars wrote in a 2014 letter to ISIS leader Abu Bakr al-Baghdadi. Firas, along with his wife and three daughters, lived under an ISIS regime in the countryside of eastern Syria for two years. At first, he was not turned against his Islamic faith, he said, but the brutality he witnessed eventually became too much to bear. “If heaven is made for ISIS and their belief, I would choose hell for myself instead of being again with them in the same place, even if it’s paradise,” he told NBC News.